Click the green Get Started button near the bottom of the page. If you’ve never used Eventbrite before, you need to set up an account. It’s simple to do: provide your email and a password, and you’re ready to go. Conveniently enough, the Create an Event page appears. 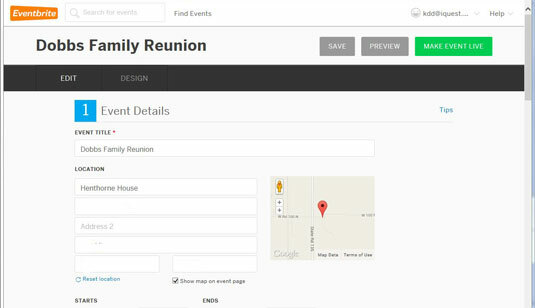 Enter the event's title and location. You have 75 characters to use for the event name. In this case, Dobbs Family Reunion. 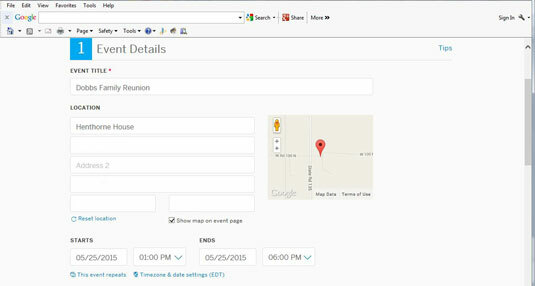 If you don’t want the map to be visible, you can uncheck the Show map on event page checkbox. Set the date and time for your event. The event time boxes populate with what seems like a random time about a month from the date and time the event is being created. Set them to the actual time of the event. Note that you have the option to set up a repeating event, such as a monthly book club meeting or antique fair. 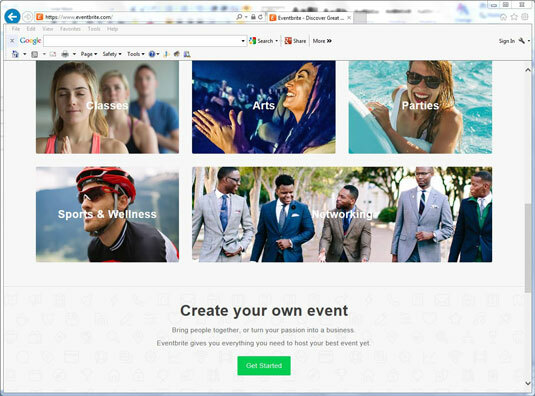 Add a logo and event description. The logo is optional. You can upload any image you’d like, very similar to uploading an image to a Facebook page. After you add the logo, you have the option to remove it. Enter the name and description of the organizer. 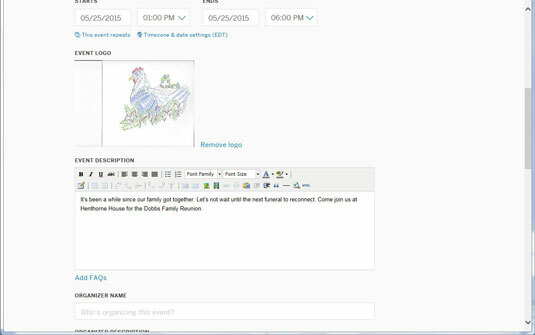 For the organizer’s description, you probably would use something like “Chairwoman,” “Vice President,” or “Mother of the Bride.” In this example, the organizer is identified by her connection to the family having the reunion. You have three choices: Free Tickets, Paid Tickets, or Donation. Remember that Eventbrite doesn’t charge the organizer a service fee for free events. 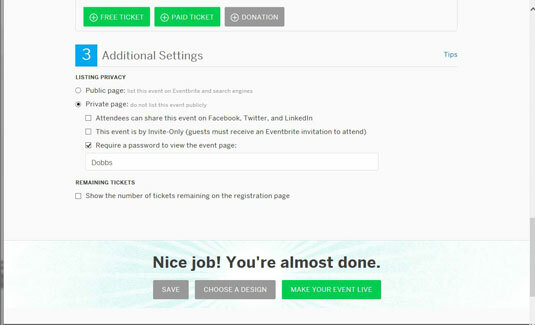 You can name your tickets anything you like; Eventbrite offers some suggestions such as RSVP, Early Bird, and so on. You also can set any quantity. Remember, if you are organizing an event in a public building, you often are restricted by the number of occupants allowed in the building. Choose the additional settings you'd like. You have two choices for posting the event: public or private. Public is default. If you select Private page, you are given three additional choices: sharing on Facebook, by invitation-only (guests must receive an Eventbrite invitation), or requiring a password to view the event page. 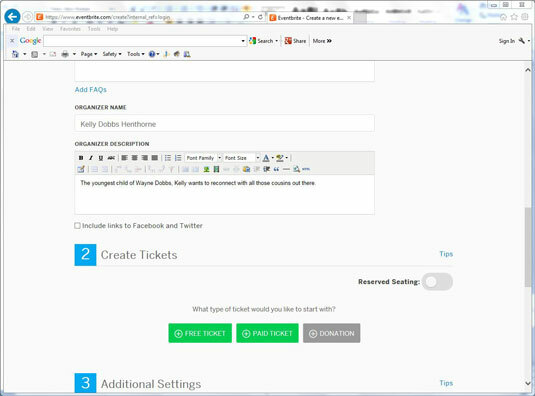 You also have the option of checking the box that has Eventbrite post the number of tickets remaining on the registration page. 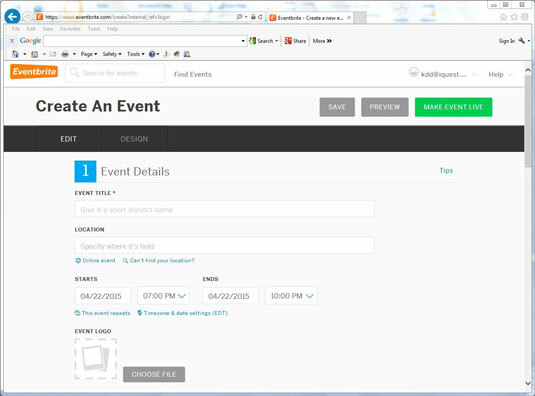 Select the Make Your Event Live button. 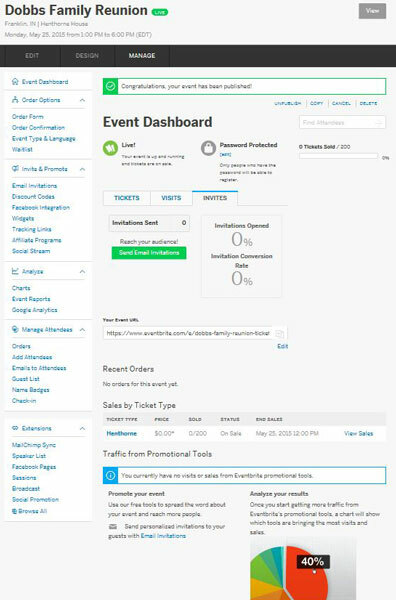 Your event goes live, and you are taken to the Event Dashboard.